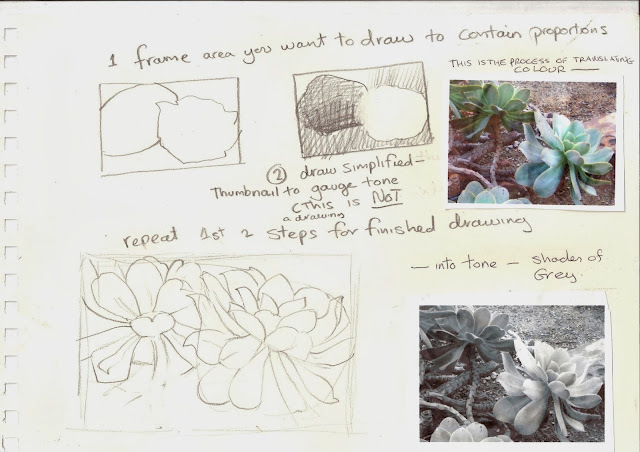 THEN THE OBJECT OF THE EXERCISE WAS TO MEASURE THE PERAMITERS OF THE 2 CACTI HEADS, AND PLACE THEM IN AN OBLONG FRAME, AND THEN DO A THUMBNAIL SKETCH, ( FIG 2 ) ABOVE, SIMPLY TO ASCERTAIN THE INTRINSIC TONAL VALUE OF EACH OBJECT IN BOX 1 AND 2. FOR THE THUMBNAIL, IN ANTICIPATION OF MY BEGINNERS WISHING TO LAUNCH STRAIGHT INTO DRAWING A PICTURE WITHOUT FIRST DOING A PRELIMINARY THUMBNAIL TO ESTABLISH TONE. BELOW IS AN EXAMPLE OF AN EFFECTIVE THUMBNAIL DRAWN BY A LEARNER WITH PREVIOUS EXPERIENCE OF MY TEACHING PRACTICES ( SEE SMALLER SIMPLIFIED VERSION ON THE TOP ROGHT OF HER PAGE ) THIS IDENTIFIES AN ABSTRACTED AND SIMPLIFIES VERSION OF WHAT WE WERE LOOKING AT, IT IS ESSENTIAL AS ARTIST TO WORK THROUGH THESE EXERCISES IN ORDER TO TRAIN OUR BRAINS TO SEE IN THIS WAY, IN TERMS OF TONE AND COLOUR SHAPES. A THUMBNAIL HELPED THEM TO BLOCK IN TONE ON THE OBJECT AS A WHOLE, AND TO TAKE ACCOUNT OF THE RELATIVE TONAL VALUES OF THE BIGGER PICTURE. IF I HAD ALLOWED MY LEARNERS TO START SHADING IN WHEN A CAREFUL DRAWING HAD BEEN COMPLETED, THE TEMPTATION MIGHT HAVE BEEN TO SHADE THE LIGHT AND DARK OF EACH INDIVIDUAL PETAL AND TO LOSE TOUCH WITH THE OVERALL CONTRAST BETWEEN THE 2 CATI HEADS, WHICH IS WHY WE FIRST BLOCKED IN ONE DARKER THAN THE OTHER TO START WITH, SO WE COULD HAVE A RELATIVE SHADE TO ADD RELATIVE DARKS ONTO. IT WAS PERHAPS NOT APPRECIATED HOW TRICKY THIS CAN BE TO RECOGNISE. HERE WE ARE LOOKING AT A CONVERSION FROM COLOUR TO TONE, TO SEE THE TONE MORE CLEARLY, SQUINT AT THE BLACK AND WHITE PHOTO, TO LOSE DEFINITION OF THE SUBJECT, AND SEE IF YOU CAN DRAW A SIMPLIFIED THUMBNAIL OF THE TONE SHAPES.